I just completed an intense 2 month semester on graduate level Statistics. Not only am I relieved to be done with it, I am happy to report I did really well! I am behind with hundreds of photos to share and the slew of spam that flew into my comments section just recently lit a fire under my bum to get some content up here. So, B and I celebrated our 2 year wedding anniversary when winter coats were needed, though if I am being honest, for the Tuesday after Memorial Day Weekend, it is certainly chilly on the east coast. It also feels like it has been raining for a straight year. The Salted Pretzel cake from Milk Bar is just as good as we remember it. They were able to rush the delivery for me since I was a little late on ordering but it was a great addition to our anniversary celebration. With Valentine’s Day just the day before, the restaurant was slow except for some couples coming in to do their wedding tastings. We pretty much had the joint to ourselves. A bottle of champagne was a must and we soaked in the romantic ambiance at MyMoon while we waited for our meal to arrive. They talked us into getting the cheeseboard… they neglected to tell us how large it was. We had a great time stuffing our faces. I have never met a cheese I didn’t like. B had the lamb chops over fingerling potatoes. A sensible portion in comparison to the mammoth cheese plate we both devoured. I had the seared duck breast with cherries and mashed sweet potatoes. The duck breast was perfectly cooked. We were pretty stuffed but decided to split a cheesecake with mango gelee that came with a scoop of mango sorbet. It was nice and light… but we were stuffed! We spent the rest of the week eating anniversary cake! Looking forward to celebrating many more! During the hustle of work and the heavy weight school has been, taking a break from real life to spoil my main was incredibly fun. The experience was a very special one. We started our day with a Broadway show. We had matinee tickets to see On Your Feet, the Gloria Estefan musical. I had heard good things about the show but it was phenomenal! I don’t even think one has to be a fan of her music to appreciate the story; though I’m sure it helps. As an 80’s baby, I loved Gloria Estefan. The actress who played Gloria looked and sounded just like her-quite amazing. After the show ended, we had a little over two hours to kill so we walked over to a nearby pub and had a few cocktails to kill time. For his 3oth, I took Him to Daniel on the Upper East Side. I have never been but heard amazing things. 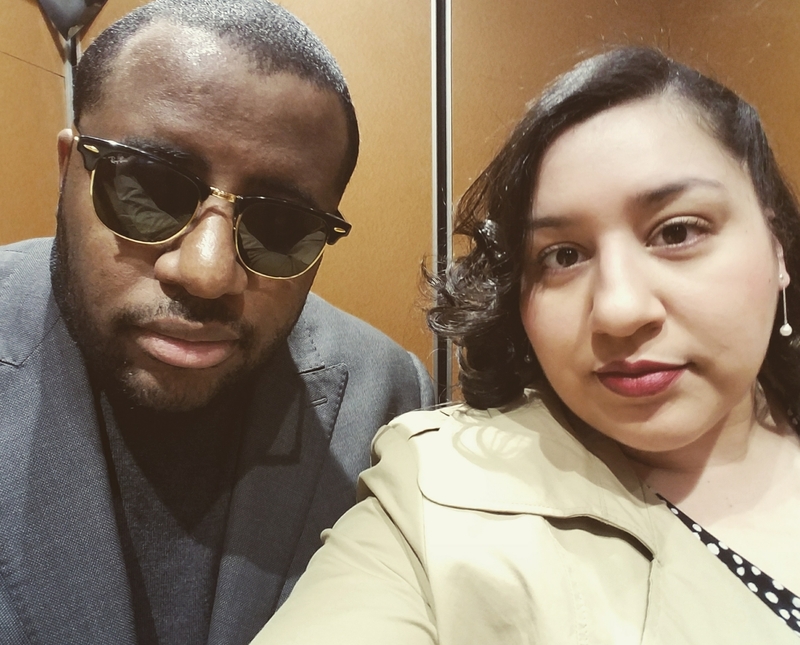 My husband is my greatest supporter and I wanted to make sure he had a memorable night. We started with a bottle of champagne. We opted for the 7 course tasting menu and since we had champagne decided against the pairing menu. 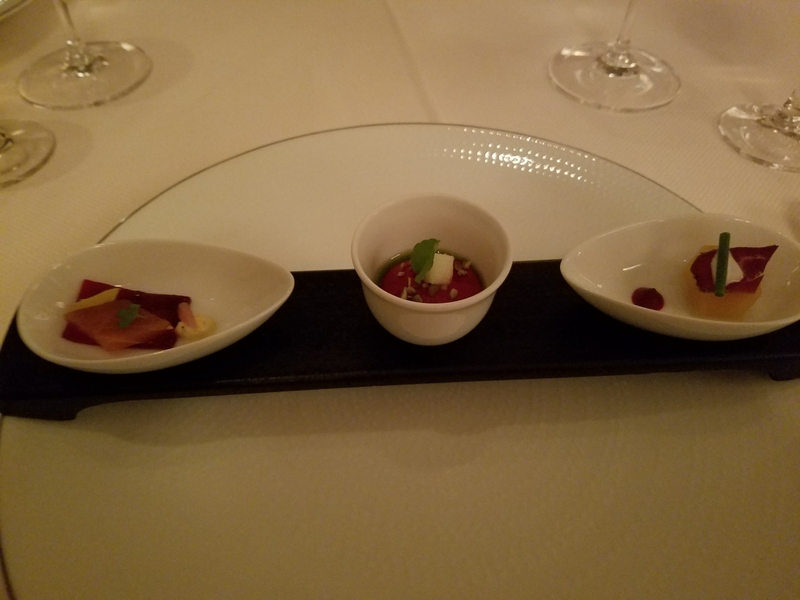 Our first official course was Beets 3 ways. 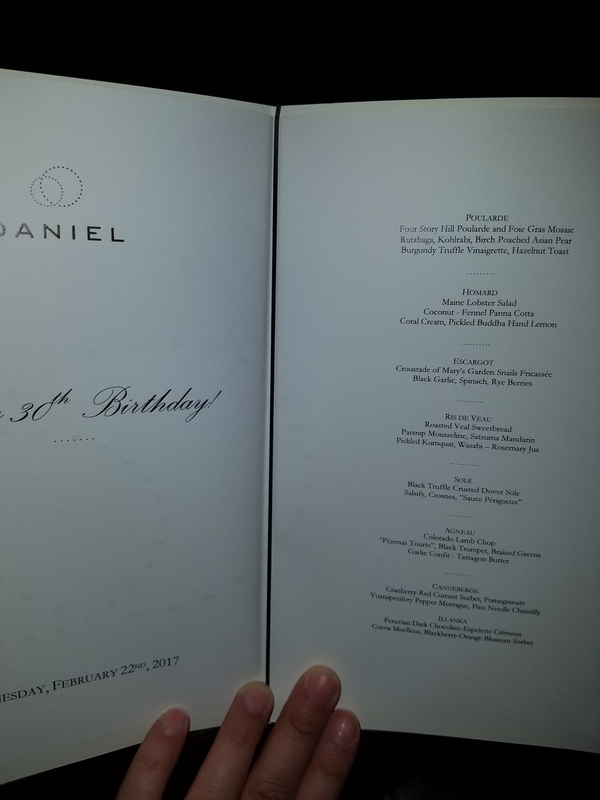 Honestly, every single thing we tasted at Daniel was delicious. I will point out what was exceptionally delicious but to avoid being redundant I will just describe the dish. Our 3rd course was a warm lobster salad over a coconut panna cotta of sorts. 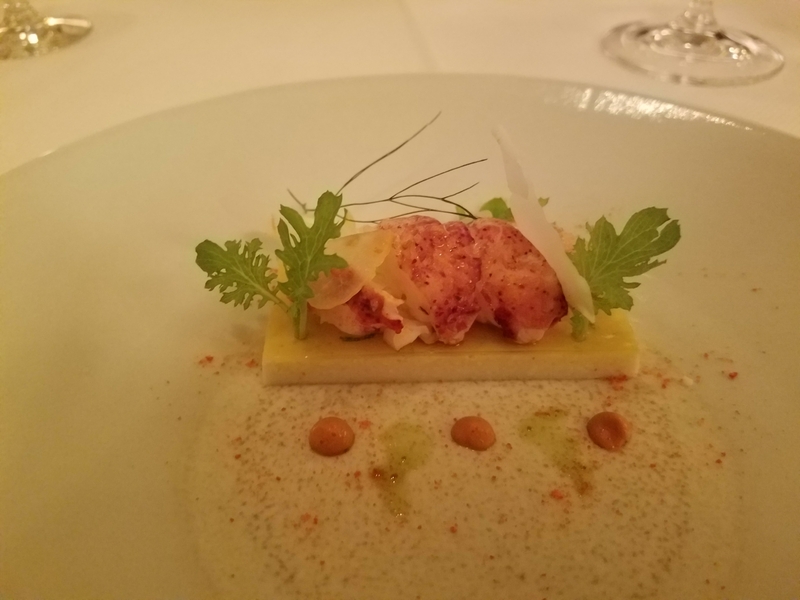 The lobster was such a wonderful texture! 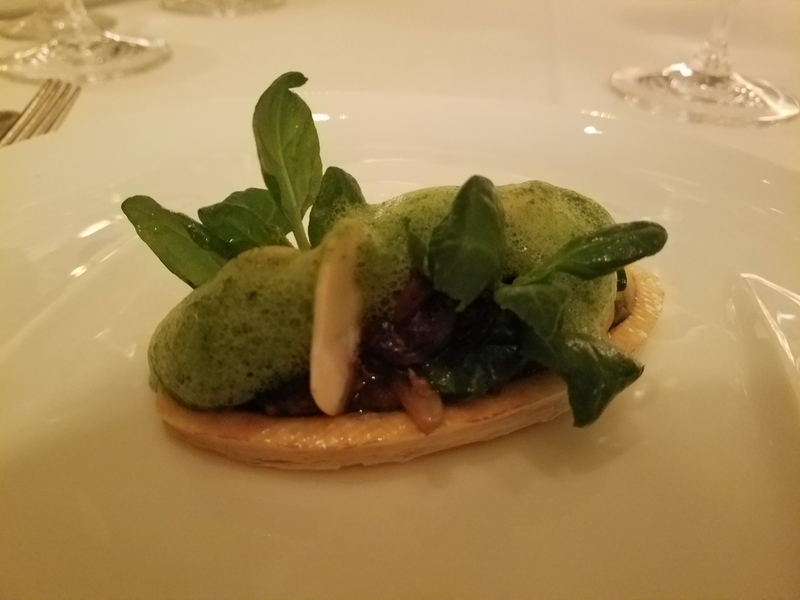 For our 4th course, we had escargot with a garlicky foam. Had they not told me it was escargot, I would never have known. Loved the presentation. 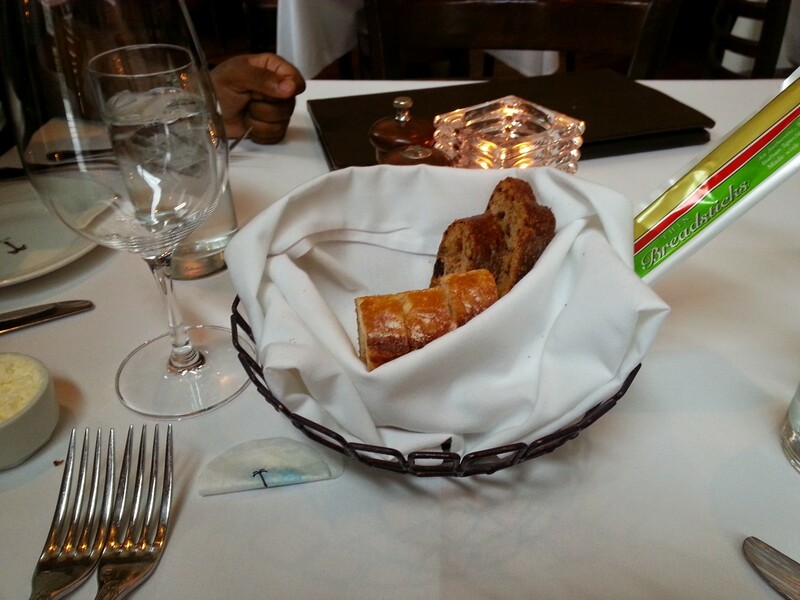 For out 5th course, we had sweat breads with citrus elements. EditCourse 6 was a delicious sole. I love the plating and how all the elements went together. Our final course was the lamb. By far my favorite dish the night. By now, hubby and I are feeling a teensy bit tipsy and way full but the plates just kept coming. A gingerbread. Some melon. And the cover over the candle is a thin sheet of white chocolate! Speaking of chocolate, I had the chocolate mousse for dessert. And hubby had the sorbet. 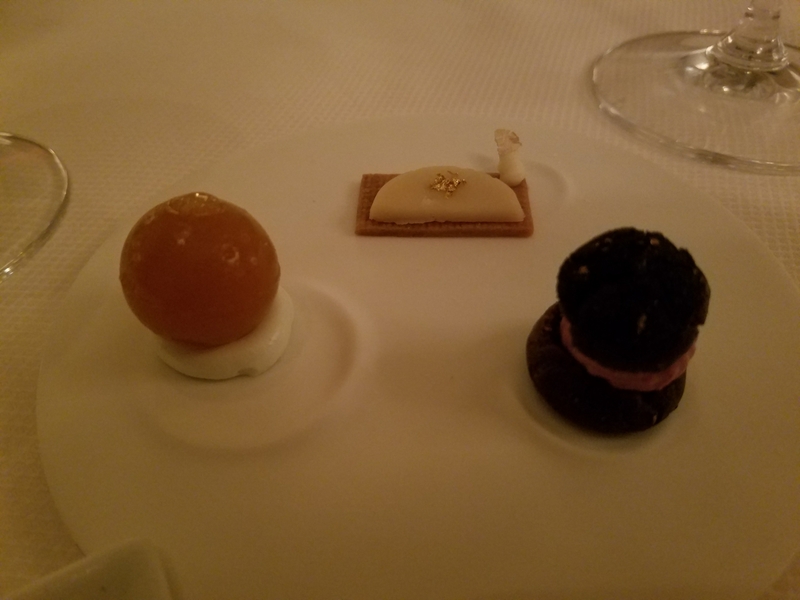 They brought out a plate of pettite fours that were too cute for words! 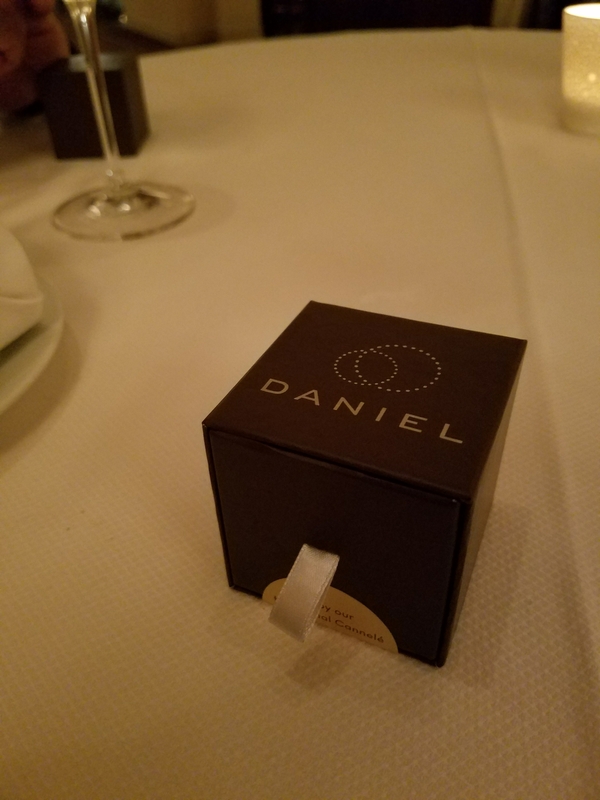 Before we left, we were given these goft boxes filled with cannelles and personalized paper copies of the menu we had. The experience we had at Daniel is one I will always cherish. 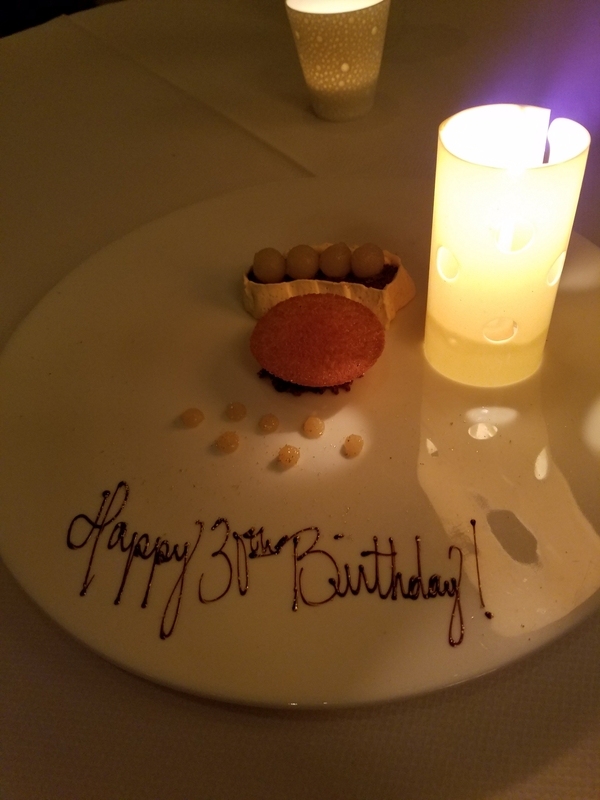 I married a wonderful man that is incredibly good to me- being able to celebrate him on his 30th birthday was such a joy. I hope you all had a very happy and healthy holiday surrounded by loved ones. My sister in law came to visit all the way from London and it was fun to play tourists in NY. We went to Coney Island in the freezing cold to show her a NY beach and then grabbed lemonades the size of our torsos at Nathan’s and had hot dogs. We went to the old fashioned ice cream parlor, Eddie’s Ice Cream Shop in Forest Hills and NY Style Pubs. Lots of walking and lots of eating. Brent got an Echo for Christmas so we took advantage of our Amazon Music to have a house party on New Years Eve. I cannot believe its 2017. While this platform is not intended to be political, I just want to express that I am embracing Love and Compassion. If you are here, and you are reading, I appreciate you and I cherish you. Thank you for being part of my life after all of these years. I hope to continue to be here to share stories of deliciousness and most importantly- JOY. I was promoted in October so work is even more hectic than it was before and if that weren’t enough, I decided Grad School was a good idea. So, starting January 30, I will officially be a Grad Student pursuing a degree in Criminal Justice. Now that we have caught up, I recently took a trip to a well-known and very hyped location in Williamsburg, Brooklyn. My friend Danielle and I left work early on a Friday and hit up this restaurant known for their Chicken and Waffles. They don’t just do Chicken and Waffles though. They have a wide variety of waffles- from sweet to savory. Bacon and Cheddar Waffles. Buttermilk. Mushroom. Dried Cherry. etc. You can even choose the way you want your chicken. Buffalo, parmesan, etc. I decided the best bet was trying the classic buttermilk waffle with fried chicken. Nice presentation. It even came with 3 flavored butters and syrup. But in all honesty, this was way overpriced. For 1 waffle and 2 small pieces of chicken, the plate set me back $17. Perhaps a chicken wing would have made me happier. But also the chicken was just okay. It was good but not something I would wait in line for hours to eat. Danielle decided to have the shrimp and grits. I must say, THIS was actually delicious. When we dine, we usually discuss two dishes we would both like to try and then split our choices; the best of both worlds, really. The bowl of shrimp and grits was $17, as well. We both agreed the Shrimp and Grits was far more superior and much more satisfying- even the half portion we both had. Yes. But if, and only if, there is no wait. 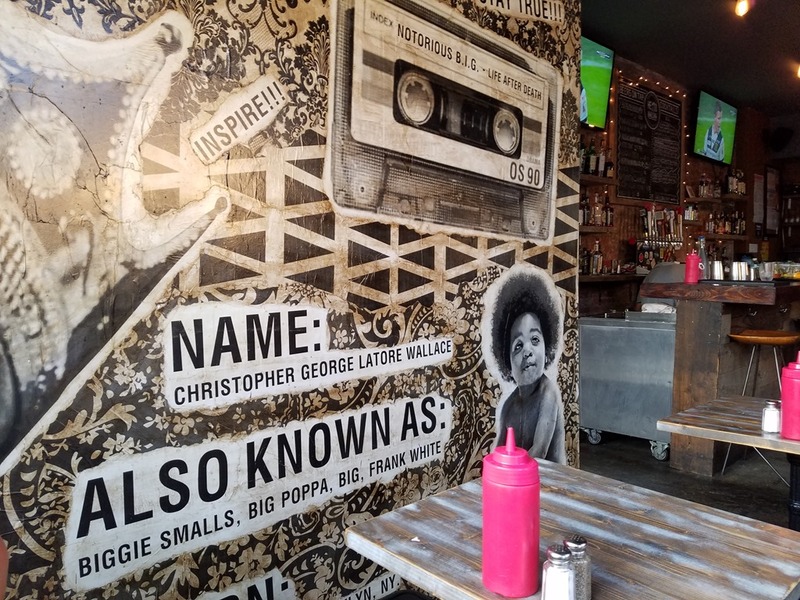 Especially with all the other options on Bedford Street in Williamsburg with great food. Love, Peace, and Chicken Grease. I mean, when I last posted I was gearing up for the busiest season at my office. I work in Tax so the days were long and days turned into weeks, weeks into months, and here we are. With the change of the season I am experiencing Migraines. Lots and lots of migraines. If anyone has any remedies to bring relief, please reach out. Coffee, Excedrin, and Vicks Vapor Rub are my go-to methods but am open to trying something new. Ah, that time my husband and I ended up at an adorable little bistro because the original place had lost our reservation. Right. Sometime in the warmer months, hubby and I gussied up for dinner just because. We made reservations for a chef tasting that needed to be made in advance. When we arrived at the restaurant, they had no idea we were there for a tasting and sat us a at a table for 4 with another couple already there… can you say awkward??? One of my biggest pet peeves is dining with strangers. NYers are no strangers to crowded places but the act of dining should be somewhat intimate- it’s bad enough tables are 2 inches apart from each other but I need those two inches separating me from another set of diners. I digress. They lost our reservation. We went to another restaurant. We contacted the people that lost our reservation and they invited us back to make up for the error. It was probably one of the hottest days in the summer. Hubby and I dressed down so we could be comfortable. 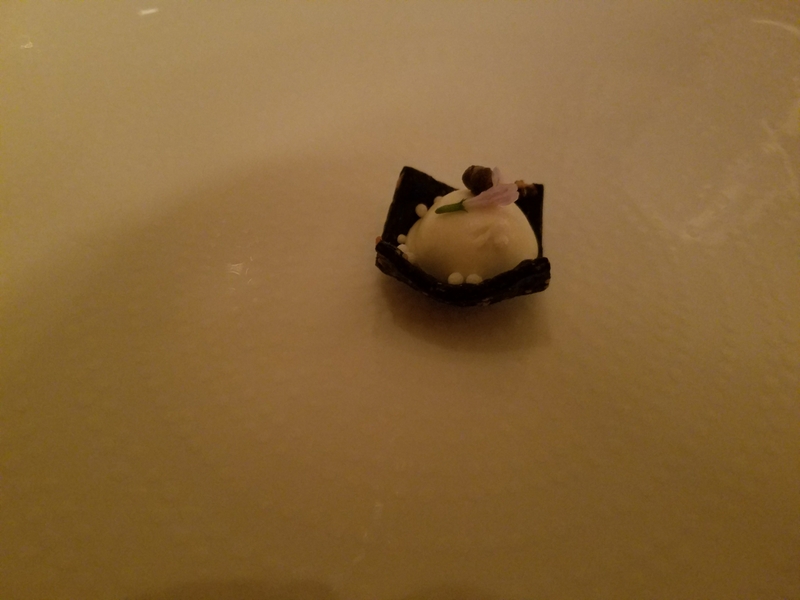 It was a 5 course tasting so comfort was definitely on the list of priorities. This time around, our visit was great! Not only was our reservation saved, but they remembered I preferred to dine semi-privately so we had a table in a corner booth all to ourselves. That alone was worth the entire “ordeal”. We started with a chilled corn and crab soup. The portions for this tasting were… on the heavier side. We arrived hungry but, spoiler alert, we were STUFFED afterwards. The Chilled corn soup was velvety and sweet with hearty chunks of lump crab meat. They paired it with a crisp chilled white wine. We also had a salad course that I forgot to click… but you don’t win friends with salad. Amiright? Next up, we had a trout dish with veggies. 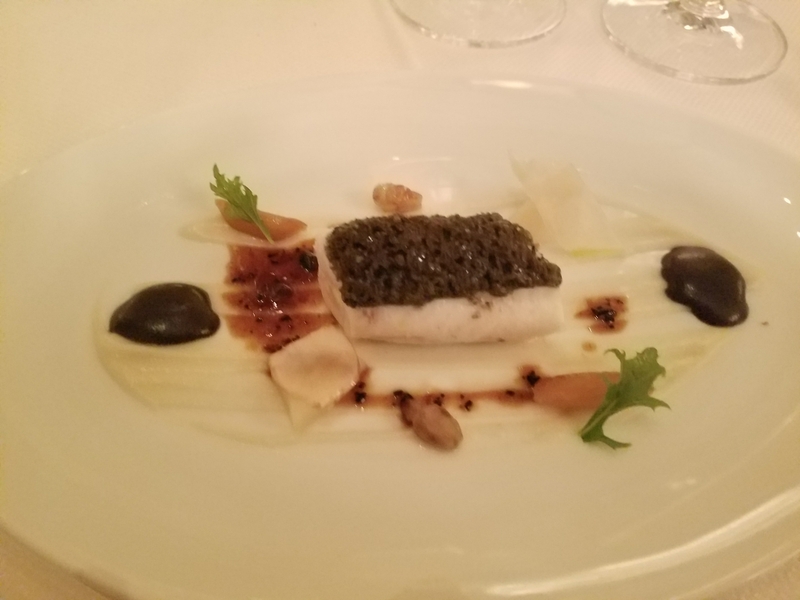 Wasn’t a huge fan of the trout as this particular presentation was very bony and if you take big bites like me… you’ll surely choke. Lol. Ain’t I a classy one? The chef, feeling bad for what had happened to us the first time we got here, offered us an additional course to make up for the error. A buccatini dish that was probably the best thing we ate all night. It was incredible! At this point of the night, we were running out of precious stomach room…but we had to press on. Short Rib. With a butternut squash puree and sautéed bok boy. The big finale was a delicious warm chocolate sauce poured over a chocolate shell that melted to reveal a scoop of ice cream. It was a shared dessert. It was difficult to get through. Once we finished our meal, we graciously thanked our host and chef for the memorable meal. They had more than made up for the previous error and their service will bring us back for more of everything! 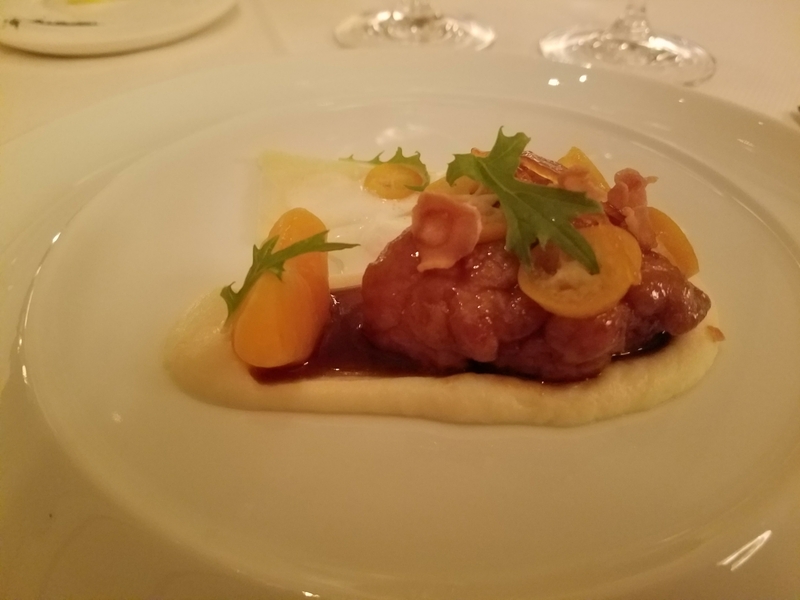 Restaurant week is a seasonal event in NYC where select restaurants offer prefix lunches ($29) and dinners ($42) at a fixed price in the five boroughs. It started nearly 10 years ago and has gotten so popular that the “week” usually lasts about 6 weeks; giving one ample time to get as many deals as possible. 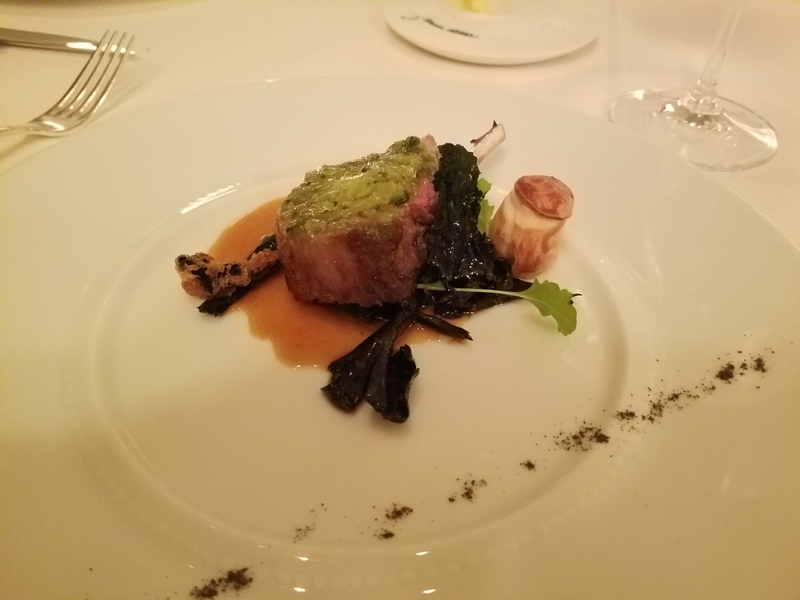 I personally like experiencing a restaurant that I would normally not visit but I also find that the experience is very different on a regular dining day then during restaurant week. Never the less, my family and I always participate. One such place where we particularly love Restaurant Week lunches is David Burke Kitchen in Soho. There is only one thing that I actually crave here and luckily, it’s offered during restaurant week so I am one happy lady. It was very easy to obtain a reservation for 1PM on a rainy Sunday in SoHo. My husband, parents, and I arrived hungry and ready to feast. For $29, we were entitled to an appetizer, an entrée, and a dessert. Not too shabby. We almost all ordered the same exact thing which means no tasting anything new… but when you know what you like, there isn’t really a need for all that. I had a cup of coffee which was nice and strong- perfect little jolt! For starters, everyone minus Brent ordered the plain Greek yogurt with house made granola, nuts, berries, and honey. This is no ordinary bowl of yogurt. I cannot explain why this tastes as good as it does but I have a feeling it has to be the full fat yogurt. It was tart and creamy with a hint of sweetness from the honey and berries. We scraped our bowls clean. As my entrée, I ordered the burger. A huge heavy burger to go on top of the bowl of high protein yogurt I just scarfed. 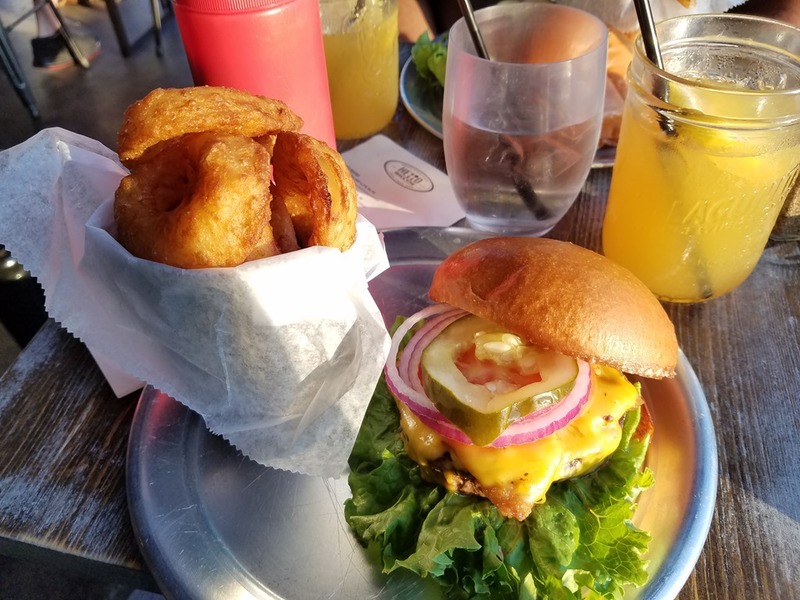 The burger was delicious but I barely finished half. 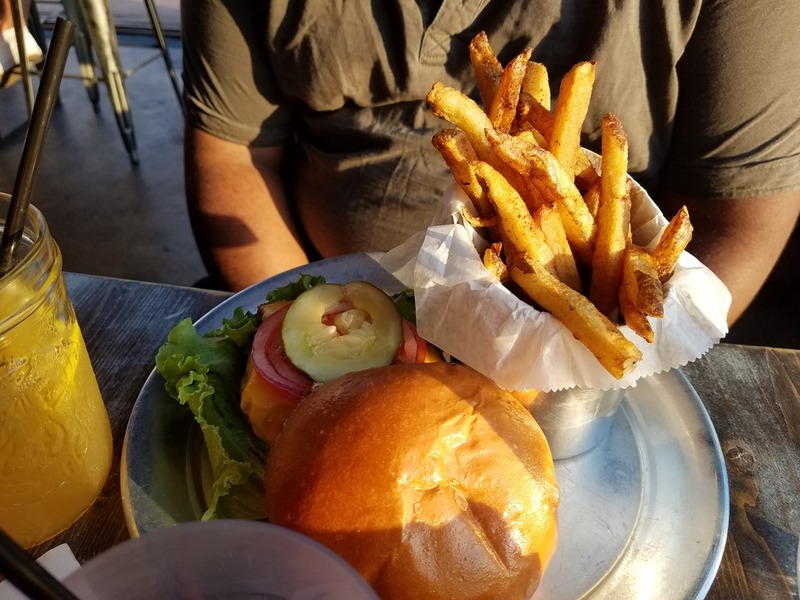 I packed the burger and fries to go (which were perfect later that evening for dinner!). 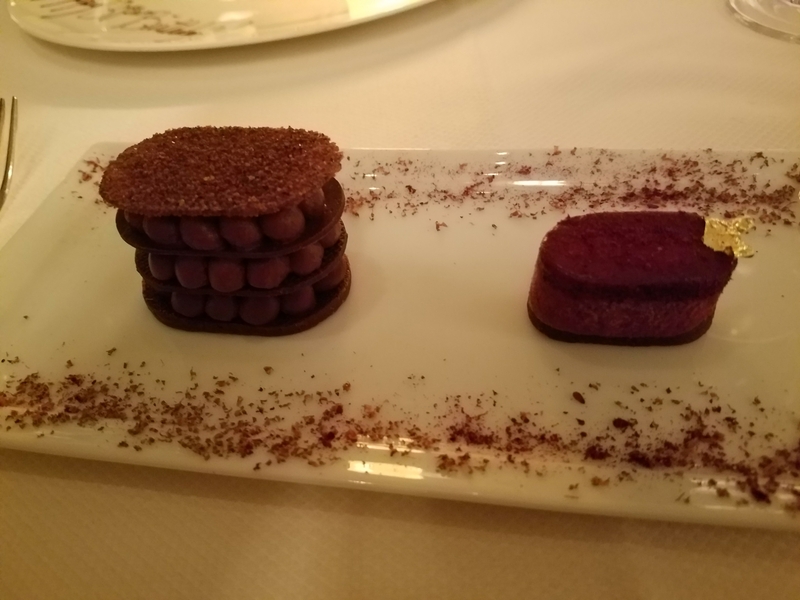 Dessert was a super-rich chocolate cake. I managed half and had to give up. Being full was a major factor but the richness on top of that was just too much. I left with a lot of leftovers. But for $29, the prix-fixe is a great bargain. While the Restaurant Week promotion is over until Winter, the bowl of greek Yogurt at David Burke Kitchen is worth a trek to SoHo when you’re craving it! This time last year, a Spanish restaurant stood on the very corner I found myself on Sunday evening. But now, instead of a Spanish restaurant, a burger bar is in its place. hip hop and R&B- 80’s babies rejoice! We started with some cocktails. Great summer cocktail. Don’t even know the name. Just looked at it and said yes. Sometimes you gotta be impulsive that way. Back in January, I had the privilege of visiting Manila Social Club in Williamsburg, Brooklyn for a Yelp Elite event. Having heard a lot about this place and their infamous 2hours and up wait list to dine, I seized the chance to visit for this private event. It’s no secret that I love Filipino food. It’s my greatest comfort with dishes similar to those from my Hispanic roots; like Lechon Kawali and chicken adobo to name a few. The Yelp Event was amazing and I made a mental note to come back for brunch or dinner service. My new co-worker, who is new to New York, asked if I had ever been. We had a brief conversation about it and she said Let’s Get Brunch! Having familiarized myself with their crazy wait times, I suggested we arrive EARLY. So, here we were at 10:30AM on a Saturday on a rainy, nasty day in Brooklyn. We were first in line. I am sure that because of the yucky weather, people took their chances showing up a little after 11AM- when they open- and very few were fortunate to snag one of the 13 tables. That’s all they have, 13! We were seated and once all the tables were filled, arriving patrons were told the wait was 2 hrs. TWO HOURS. And they waited. Feeling like this was a golden opportunity, C and I ordered a little bit of everything. We were going to experience all of brunch! I had a cup of coffee which needed to refilled quite a bit. The coffee was nice and strong. I recently had never experienced a notably bad cup of coffee at a dining establishment until I went to a cute place in Forest Hills… so sad. One of our appetizers was the fried avocado. Wasn’t really sure about this but C requested it so I figured why not? The avocado retained its creaminess and had a delightful and light crunchy coating. The addition of a slivered pickled onion really took this up a notch. Would definitely order this again but it’s a heavy appetizer. We ordered my absolute favorite- Lumpia. A Filipino spring roll. They were crisp and flavorful. There really isn’t nothing more to add because they were amazing. Feed me all the lumpia! When in Rome, you do as the Romans do. So we ordered Spam Fries. These didn’t wow us [right away]. If you like spam, you will like these. We barely touched these but took some home and after reheating leftovers, I really enjoyed them. They seem to be dried a little before they are fried. They had more texture to them while still tasting like canned meat. In addition to our appetizers, we ordered sides to go with our entrees. Hindsight is 20/20. Had we known the size of these things, we likely would have narrowed our choices down by half. We were running out of precious stomach room. The longaniza (AKA sausage) hash was the most anticipated item but sadly it disappointed. It was just okay. The presentation was great but led us to expect unctuous spoonfuls of hash. We got very soft potatoes and very little sausage. Would pass on next time and just get a side of sausage. C got the soufle mango pancake with ube ice cream. A monstrosity! A cakey, fluffy, delicious monstrosity. Her ube ice cream was delicious too. She wanted a side of eggs which were buttery and fluffy. I got the tocino (bbq pork belly-ish) with two eggs over garlic rice. The eggs and rice were great. The tocino was sadly dry. Flavor-wise, I enjoyed the tocino but I would likely order something else next time. About midway through our feast, we found ourselves waving the white flag and packing lots of leftovers for a massive “snack” to take home. The mish-mosh tasted glorious later in the day after a long walk and a nap. Overall, I enjoyed our experience at Manila Social Club. There were some misses/disappointments but I would definitely come back. They have a golden ube donut that is $100… but I hear good things. 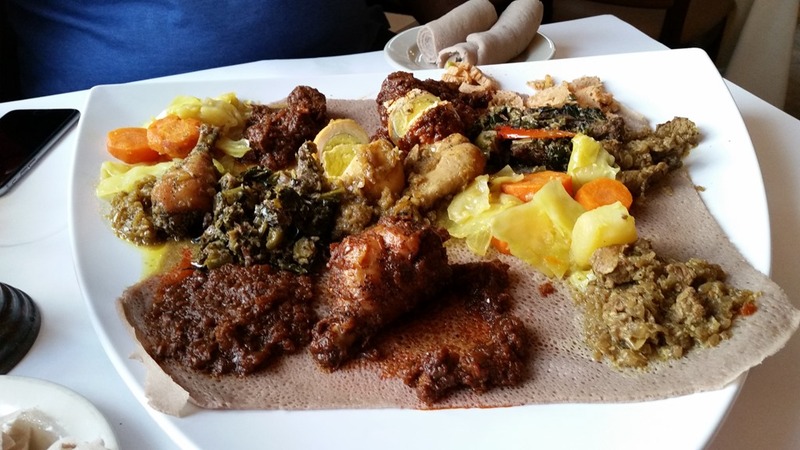 So on our last night in DC together, we found Das Ethiopian a nice walk away from our hotel room. It was a Saturday evening. We did not have reservations but it was early enough into dinner service where finding a table was not challenging. The restaurant is cozy but not so that it feels too crowded. It seems like the dining room of an actual house is the dining area of the restaurant which i thought was a nice touch. Felt really homey. We looked around to see what others were eating and it seemed a lot of diners were sharing sampling platters. It seemed like the best bang for our buck to try several things at once. 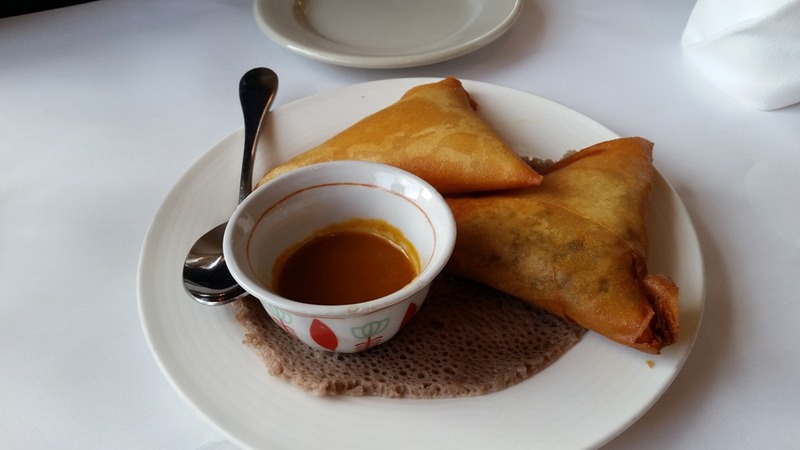 We split an appetizer that looked like a samosa but had a spring roll texture to it. It was filled with lentils which are a personal favorite of ours. We got our first taste of Injera. A spongy flat bread that is used to sop up delicious bites of food in addition to acting as a plate. It took a few bites to get used to but before we knew it, they were bringing us more rolls of injera. For our entree, we shared the Das Combination Chicken & Beef Entrée Sampler For Two which included chicken doro watt, beef kaey watt, beef alicha and beef cubes segana gomen. 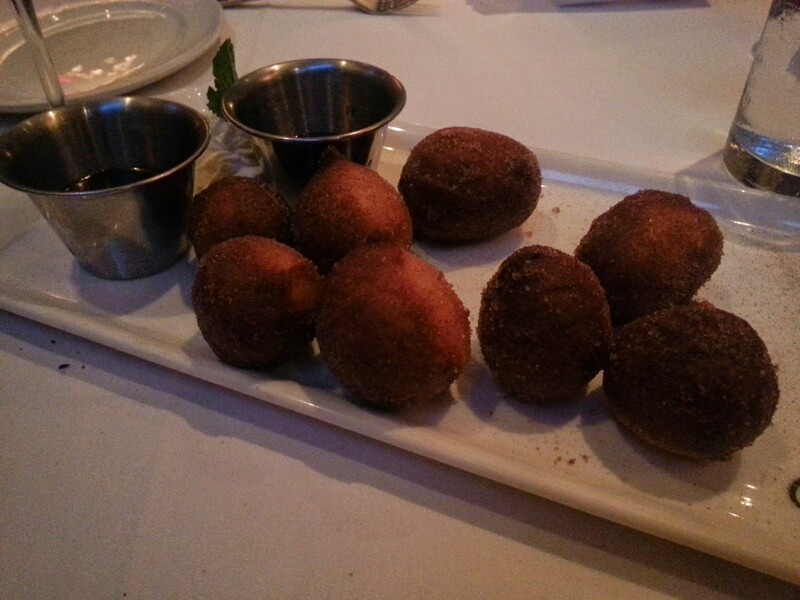 While different than any meal we have ever had, we recognized familiar flavors. It was pretty good! We filled up quickly and politely declined dessert. This is a nice place. The staff were very friendly and patient with us as we asked a lot of questions about the cuisine. We would definitely go back…maybe when I visit hubby! Well, look who decided to share. 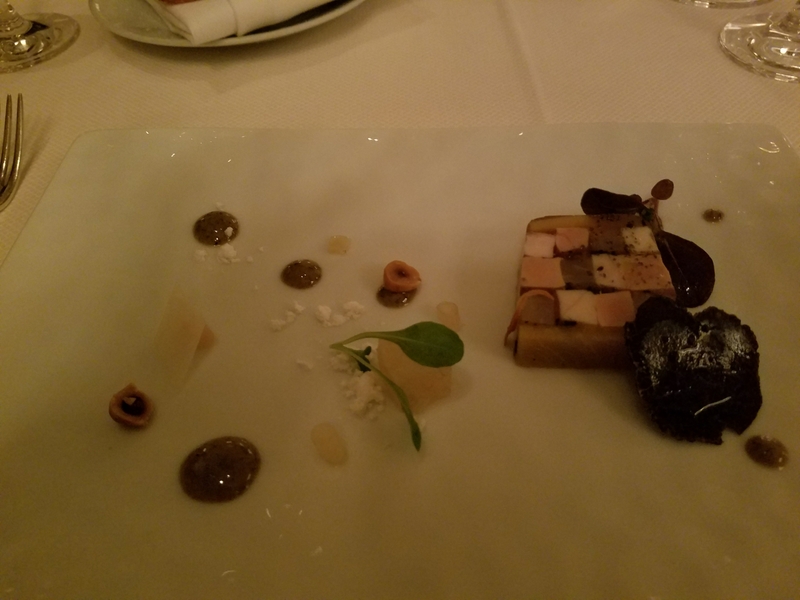 I will admit that in the last few months, when B and I are about to sit down to a dinner at a nice restaurant, he sighs with the “you’re not really going to take photos of your food here, are you?” face and I quickly snap shut my phone case like I was only checking the time. It’s not just B, though. There are restaurants that outright ban photo taking. And as a blogger for fun, stopping for a second to actually eat my meal without remembering the photo op, has been fun as well. I have even noticed service has changed- I never stopped to think of how my constant photo taking effected the folks serving me my dinner. I won’t completely stop taking photos all together but when the photos come, they will be more specialer (that’s a word because I say so). Back when I worked in Lower Manhattan, I had a hankering for lobster. I was on the internet searching and searching for a place to have a lobster dinner that wasn’t a shack or bar. It was, after all, my 2 year anniversary with B- our last anniversary before we become Mr. and Mrs. While complaining about the lack of lobster establishments to choose from (other than Red Lobster), my mother had suggested I go to the Palm. The Palm, which has several locations in NY and several more all over the country, was having a special at the time. 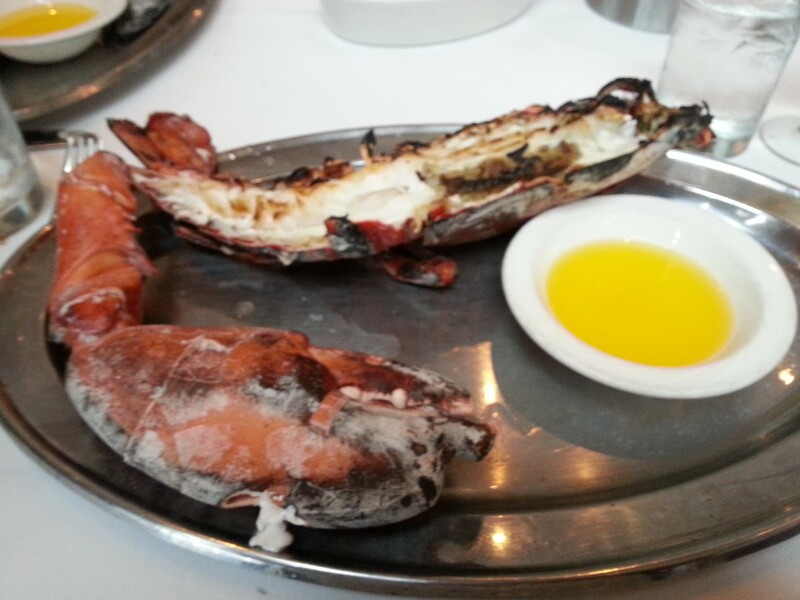 A 4 lb lobster, 2 appetizers and a side for $99; to make it a 5lber, add $20. 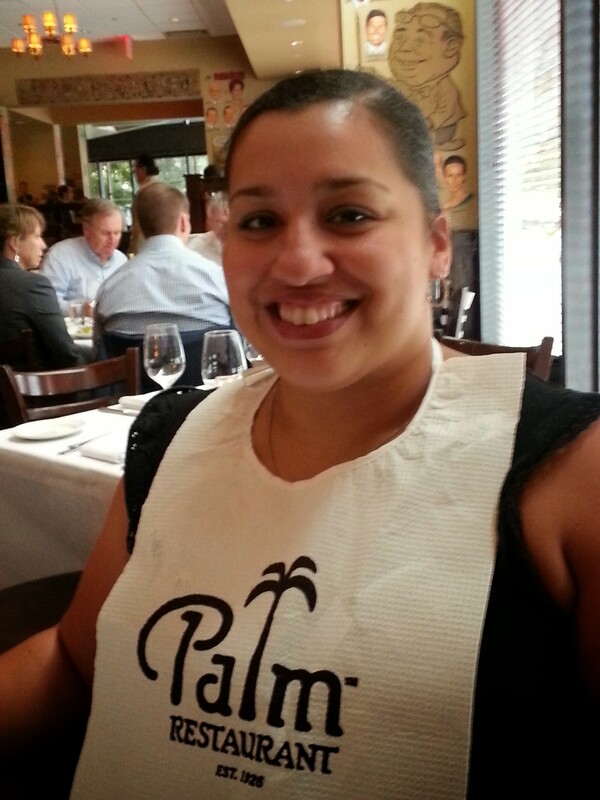 We went to the Palm Tribeca which was in a convenient location for the both of us to get to. We got there at 6pm on a Friday and dinner service was definitely starting to pick up. We both decided that we were greedy bastards and the 4 lb lobster to share just wouldn’t be enough… so we got the 5 lb. And a 3rd appetizer. And a bottle of champagne. We aren’t wealthy by any means but we do enjoy going on a dinner to splurge or treat ourselves. It’s our monthly ritual. 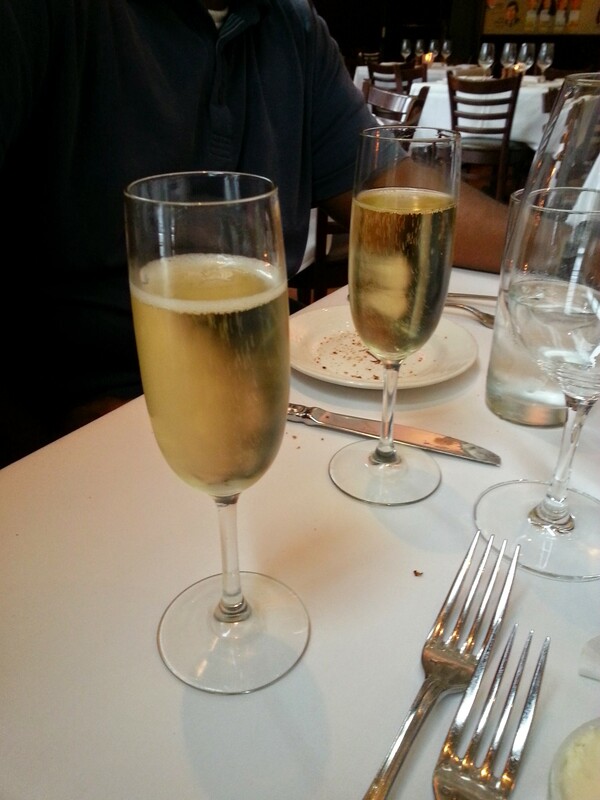 So when we chatted up our server about champagnes (because anniversary!) he talked us into getting the more expensive bottle that was on sale if we joined their club. We couldn’t resist. They said something about a free lobster on your birthday!!! Our new thing, or should I say Brent’s new thing is Caesar salads before the main course. We ordered our Caesar salads but he added an order of calamari because we were so hungry and its calamari! Both were delicious. 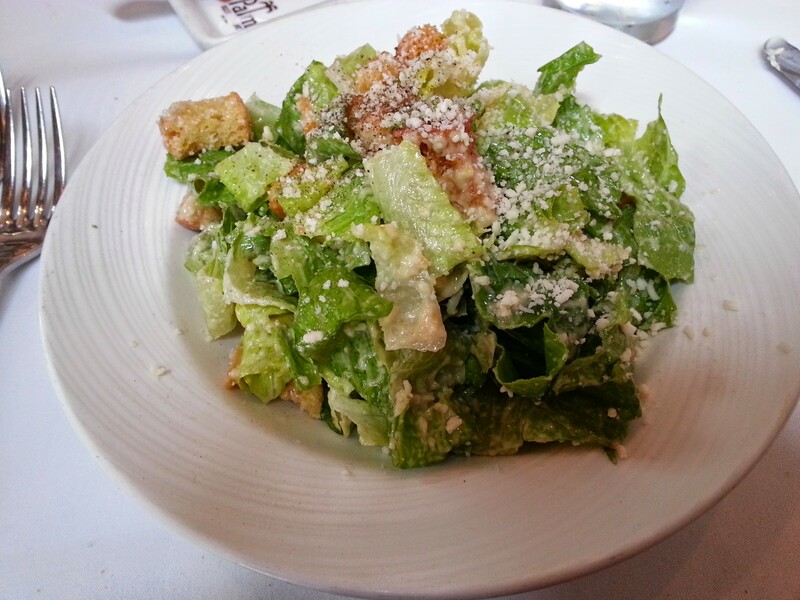 The dressing on the Caesar, just thinking about it, makes my mouth water. So creamy and tangy. 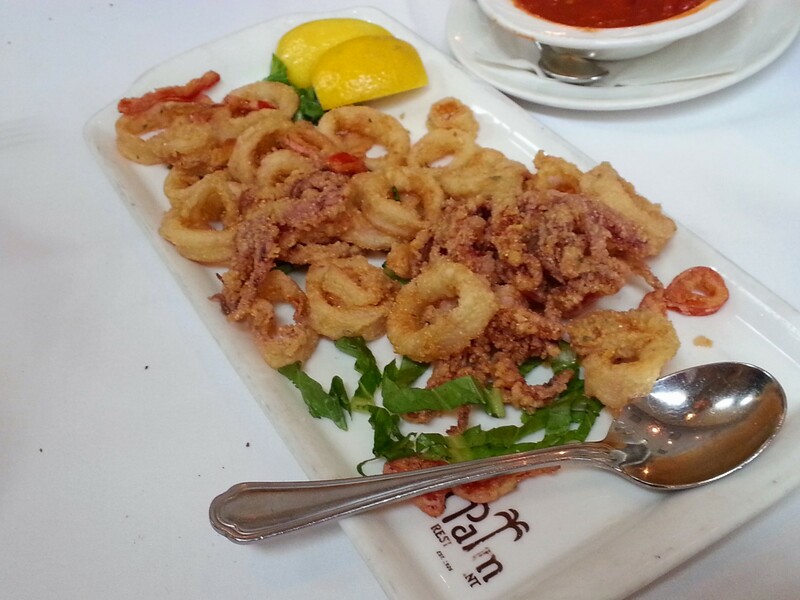 The calamari was crisp and delicious. 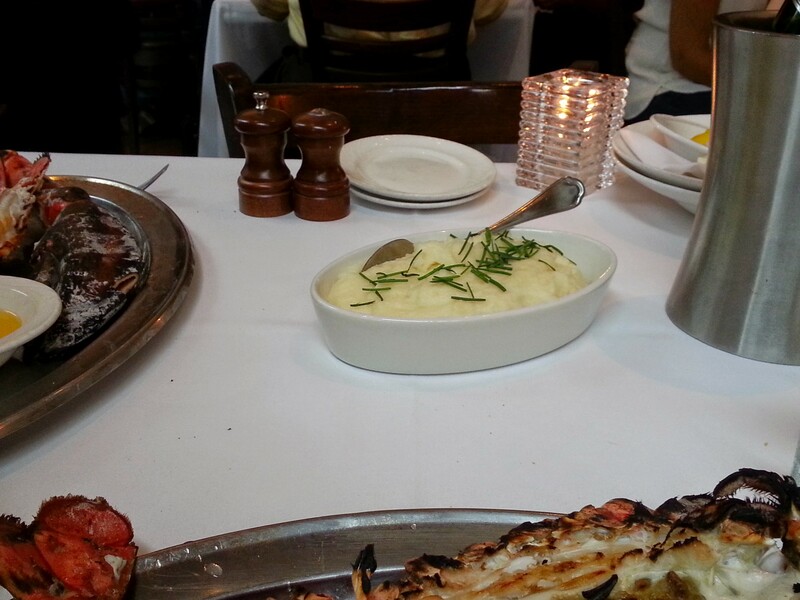 The server came over shortly after our appetizer plates were cleared to drape lobster bibs over us. Such service! And when the MONSTER lobster came out in pieces, they shelled that bad boy right in front of us. A little awkward, I will admit BUT the young man assisting us was quite the conversationalist once we started to pull some teeth (Where are you from? How do you like working here?) Once our lobster was completely shelled, we went in. In hinsdsight, the 4lb lobster was MORE than enough especially after all the starters and the heavy goat cheese and chive mashed potatoes (omg SOOO good), and even as we spooned the last of the mashed potatoes into our mouths and swallowed the last drops of the champagne I couldn’t believe my ears when we both agreed to order dessert. Fat assness. We ate all of it and considered walking home. We walked for 20 minutes after. We still were disgustingly full. Now that we are members, I can’t wait to go back! I’d definitely skip the salad though. As I write this, Brent and I have officially found a wedding venue. It’s been a very long month but at least we don’t have to worry about moving and searching for a new place. Once the shock of ReBar settled in, I started to feel hopeful again. Every time I did research on off-beat weddings in New York, I would find more and more leads. Some ridiculously expensive, but leads none the less. I’m not ready to disclose just yet on where we are planning to wed, but we visited a place worthy of a blog post. For some background, Brent and I never really saw ourselves having a traditional banquet hall style wedding. So, when we went to visit these places, we thought they were nice but they didn’t feel right to us. Also, we both want to look back on our wedding day and be glad we didn’t settle. Aurora Ristorante is a gorgeous garden-esque restaurant in Williamsburg Brooklyn. When a friend recommended them for their delicious food, the main photo on their website of their garden dining area made my stomach flutter in excitement. Part of this venue search includes the warm and fuzzies. Of course we want good food, but we ALSO want to walk into a place and FEEL like we are actually getting married there. Like dating, there has to be a spark. I felt this spark over the internet… I got there and my heart sank. Granted, the entire space could accommodate my guest list, the down side is that half of my guests would be in one room and the other would be in the garden. We filed this space away for an intimate party for a birthday or something involving 50 people or less. Since we made the trek over there and it was dinner time, we decided to sit down for a nice dinner in the garden. 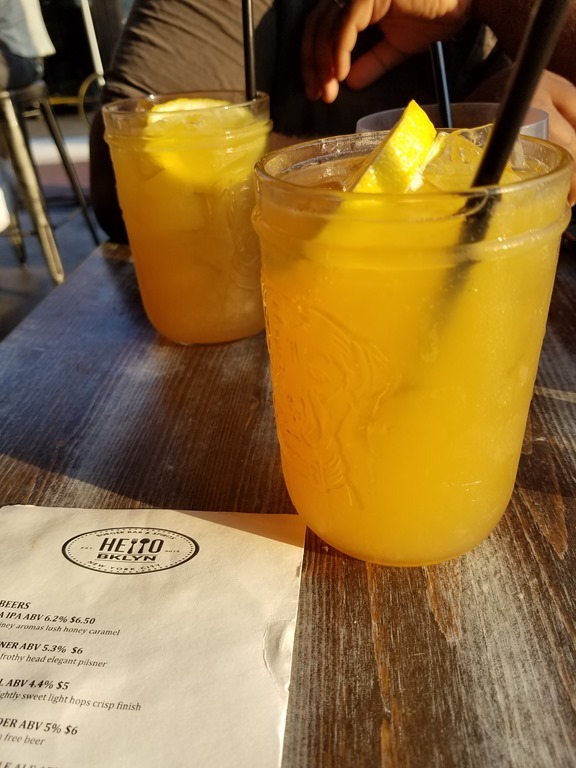 While this place didn’t make the cut for the wedding venue, this is a fantastic spot for a romantic dinner with your boo or a beautiful garden-esque place to dine on delicious eats. When we were seated, we ordered some beverages. A vodka tonic for me and a hard cider for the boy. To get the full experience, we ordered an appetizer, two entrees and split a dessert. 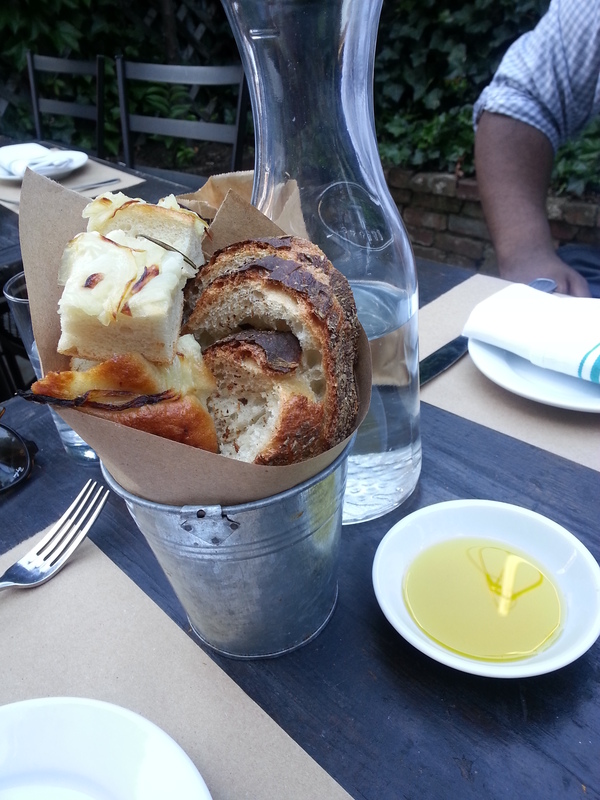 Just then a basket of warm bread and a small dish of olive oil appears on the table. Sweet Carb heaven. Warm. Crusty bread with rich olive oil. I had to limit myself to two small squares of bread. As I have mentioned on many occasions, the boy loves his pizza. 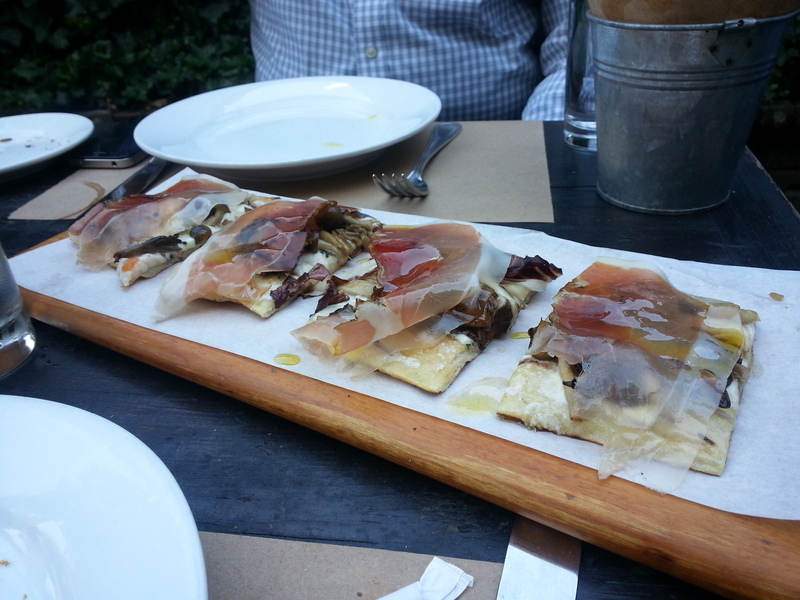 The special piazetta on the menu was a medley of wild foraged mushrooms, grilled radicchio, goat cheese, a touch of truffle oil and paper thin sheets of prosciutto on a buttery focaccia. We went in with our fingers but quickly opted for utensils as it was a little messy but what a combination!! I ordered the special of the day. 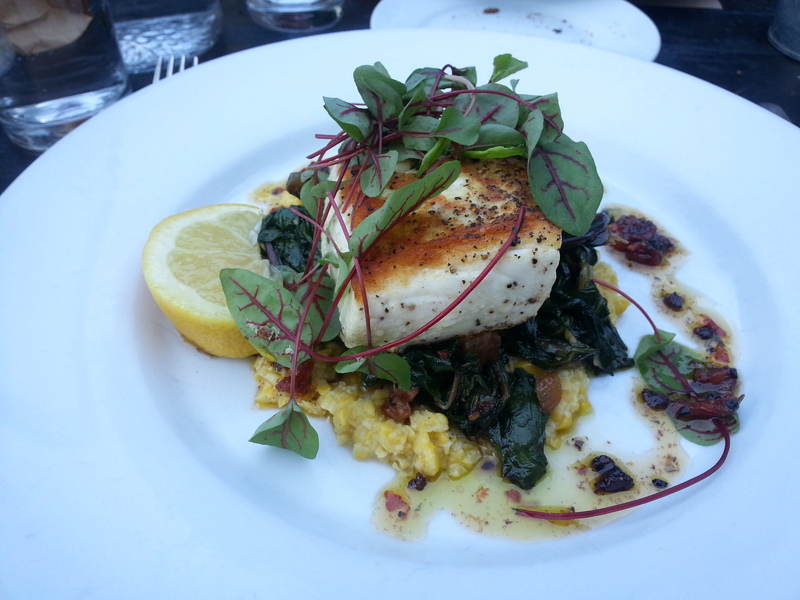 Halibut filet over a sweet corn puree and sautéed kale. 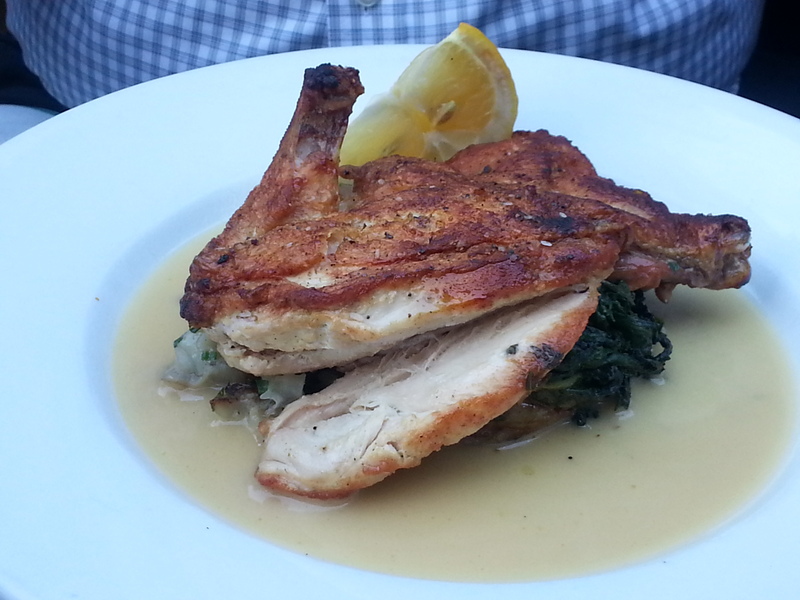 Brent had the roasted chicken with sautéed chickory and roasted sunchokes. That was so good chicken! 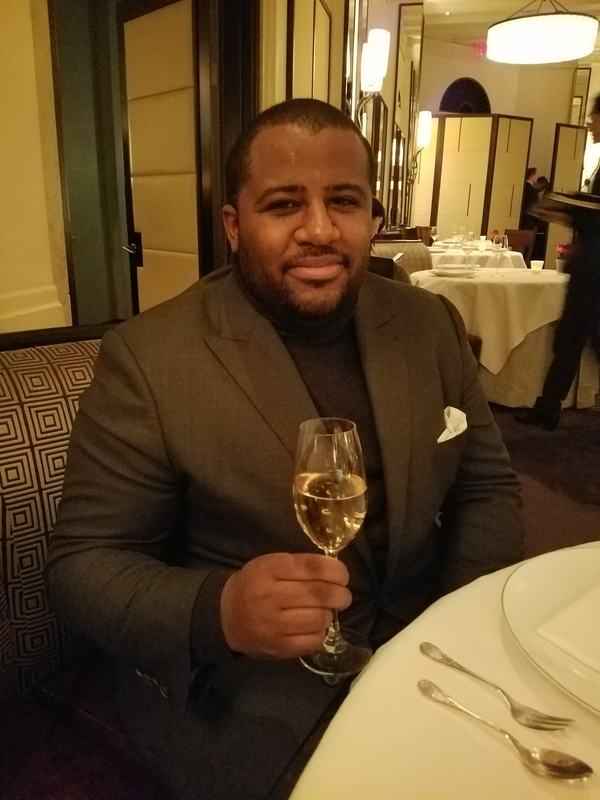 We were stuffed but my experience was not over. 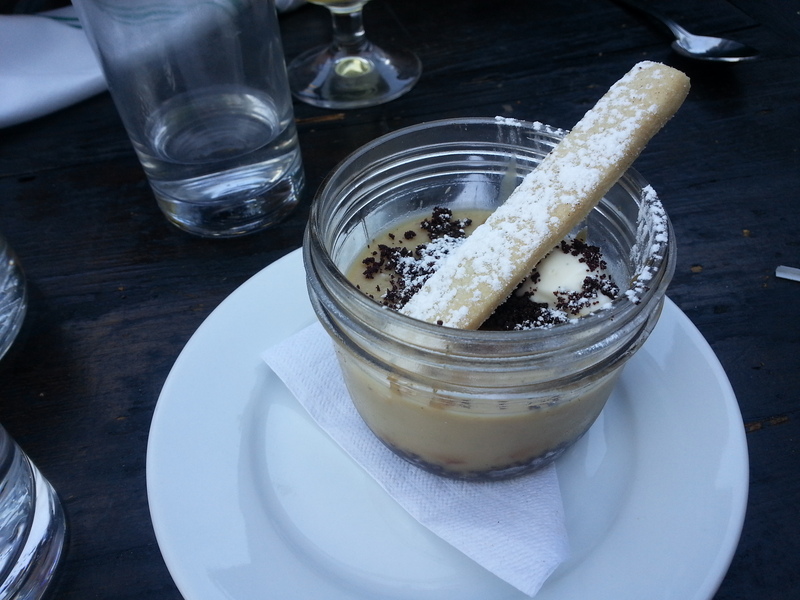 The dessert menu touted Italian classics like panna cotta and tiramisu but there was no time like the present to try something new. A velvety smooth salted caramel pudding atop a rich chocolaty cookie and garnished with chocolate cookie crumbles; complete with a healthy dollop of crème fraiche. At first bite, it was just okay but as I continued to dig in with rich, almost coffee flavored chocolate cookie with the buttery caramel pudding and tart crème fraiche, I became addicted. It is hands down my new favorite dessert. A bit of a bummer that this delicious place couldn’t be my wedding venue but mom turns 60 in six years… might have to keep this place in the back of my mind for a garden party for my queen.